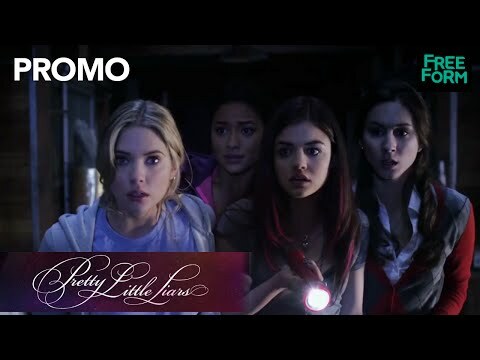 Now, as the mystery surrounding Alison's disappearance resurfaces, the girls begin getting messages from "A," saying - and threatening - things only Alison would know. But it couldn't be Alison. Could it? Whoever it is, they seem to know all the girls' secrets, and seem to be watching their every move. The girls are friends again, but will they be there for each other if their dark secrets come to light? In the seventh season of the hit drama series "Pretty Little Liars," the PLLs band together to unearth answers to the last remaining secrets and take down "Uber A" for good in the most romantic season of PLL yet. After years of being stalked and bullied by the mysterious "A" -- first, the original "A" (Mona); then later by big "A" (Charlotte); and now by their newest tormentor "A.D." -- Aria, Spencer, Hanna, Emily and Alison are ready to end the games and finish this for good. The final ten episodes will be chock-full of homecomings and reunions, including the return of Wren Kingston (Julian Morris), Pastor Ted Wilson (Edward Kerr), Jenna Marshall (Tammin Sursok), Paige McCullers (Lindsay Shaw), Melissa Hastings (Torrey DeVitto) and Sydney Driscoll (Chloe Bridges). The season will continue to be the deadliest and most romantic yet. Any and all lingering questions, including who killed Jessica and Charlotte DiLaurentis, and of course, who is A.D., will finally be answered once and for all. The season premiere will pick up immediately where the last episode left off. After hearing the news that Nicole is alive, Aria and Ezra have to deal with the fact that Nicole is back in Ezra's life and what that means for them. Spencer, fresh from being shot presumably by A.D., must now deal with the repercussions of being told that Mary Drake is her biological mother. Alison must cope with the news of her pregnancy as Emily tries to stay by her side and guide her through the next steps. After spending a romantic night together, Hanna and Caleb will explore where they go from here. 'Pretty Little Liars' Reveals A.D. in Series Finale. Did You See It Coming?